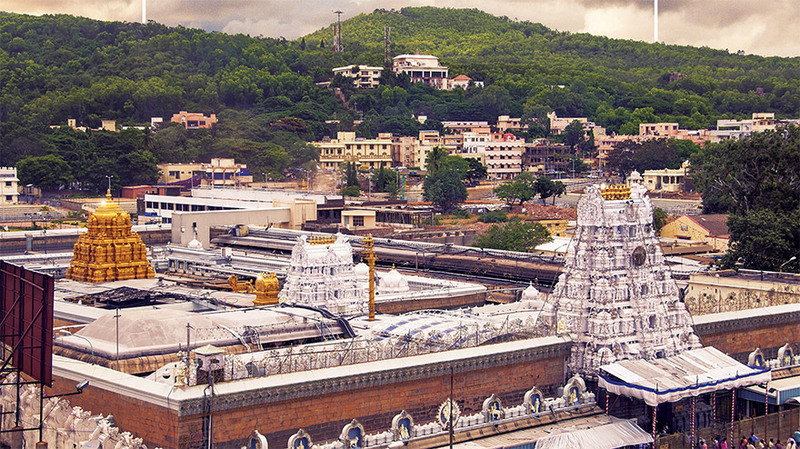 The following list explains some of the various pujas and rituals conducted at the Tirupati Balaji Venkateswara temple located on the Tirumalai hill. Every morning the Suprabhatam, Prapatti and Mangalasasanam slokas are recited, and a descendant of Tallapaka Annamacharya sings a few of Annamacharya’s sankeertanas. Devotees present at the time of Suprabhatam can have the Lord’s Suprabhata Darsanam, also called Viswarupa Sarvadarsanam. Kalyanotsavam is also known as Vaivahikotsavam or Pendli Tirunal. It is conducted in the Kalyana Mandapam and its rituals are similar to those followed in Hindu marriages. The utsava murti of the Lord (Malayappaswami) is the bridegroom and the two nachchimars are the two brides. An imaginary family pedigree of the contracting parties is recited during the course of the ritual. The deities of the bridegroom and brides face each other with a screen in between. They are allowed to see each other only at the appropriate auspicious moment when the screen is removed. Marriage homams are performed. A purohit conducts the marriage and an archaka is consecrated to perform the homams and other rituals, on behalf of the bridegroom. After the marriage, valuable clothes are presented to the brides and the bridegroom and to the purohit and the archaka. Dakshina is also given to the brahmins who officiate at the function. Sweets, cake and food are offered to the deity and distributed to those who are present. In terms of rituals, Pratyeka Kalyanotsavam is the same as Kalyanotsavam. Tomala Seva involves the decoration of the Lord with flowers. Tomala is the shortened form of the Tamil expression ‘Toditta Malai’ (adorning the deity with garlands of flowers). The flower garlands are prepared in Yamunat-turai. According to tradition, there are fixed specifications as to the kinds of flowers to be used, their source and the length of the garlands. The periya jiyar of the temple or his ekangi bring the garlands along with a lit torch in a procession, to the accompaniment of the beat of the jeghanta. The deity is then adorned with the flowers , while the mantra- pushpam is recited in the Sayana Mandapam. The service comes to a close with the waving of the flame known as nakshatra-harati, the sprinkling of mantrodaka, waving of vinjamara, and the priest dedicating the service to the lotus feet of the Lord. During the service, the Vaikhasana priest is assisted by the ekangi. Admission for Tomala Seva is through the Vaikuntam Queue Complex. Koil Alwar Thirumanjanam is a purificatory ceremony that takes place in the sanctum. It is performed four times a year – before Ugadi, Aanivari Asthanam, the annual Brahmotsavam and Vaikuntha Ekadashi. After the first bell, the smaller deities and other articles including the aghandam deepam in the sanctum are moved to the ante chamber. the main deity of the Lord is covered with water-proof material. The sanctum is then cleansed and a ground paste of kumkum, karpooram (camphor) and chandanam (sandalwood paste) is applied to the walls, ceiling and floor. After some time, the walls are wipred clean. 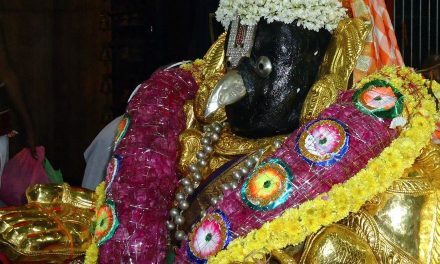 The water-proof covering on the deity is removed, and Laghu Thirumanjanam is given to the main deity and Bhoga Srinivasa. Food is then offered to the Lord during the second bell. Pavitrotsavam is a purificatory ceremony, the objective of which is to expiate the mistakes and offenses arising in the daily worship of the deity. This function is elaborately performed in the month of August every year. Pushpa Yagam is the worship of the Lord with a variety of sweets and fragrant flowers. It is conducted on sravana nakshatram day after Brahmotsavam. First Archana: During the First Archana, also called the Sahasranama Archana, the Lord is worshipped by reciting the Sahasranamam (1008 names of the Lord). Admission for Archana is through the Vaikuntam Queue Complex. First Bell: This is the first Naivedyam (food offering) to the Lord for the day. Naivedyam is announced by ringing the two bells, followed by Sattumura (recitation of a few psalms of the Prabandham by the Jiyangar or his assistant and the Vaishnava acharya purushas), and the distribution of curd-mixed food among them. Food is also offered to to Vishwaksena, Garuda and the Nityasuries. 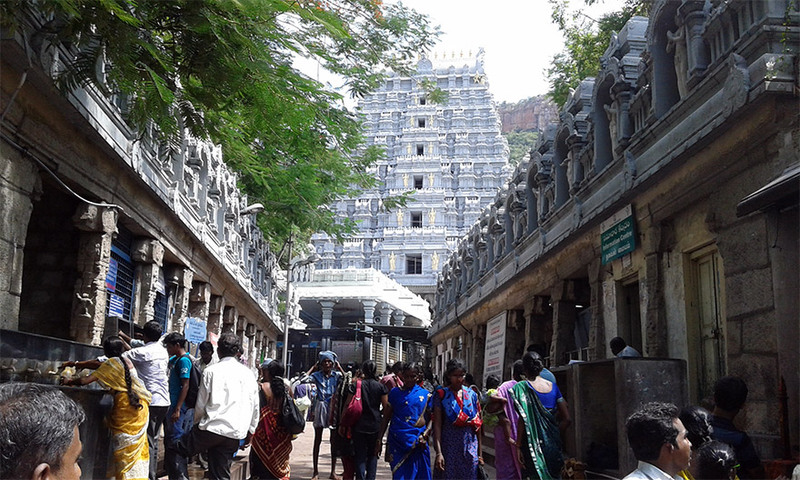 The ringing of bells and Naivedyam are popularly known as the First Bell of the temple. Second Bell and Second Archana: The Second Bell or Aparanhapuja is the second Naivedyam for the Lord. It is followed by a second Archana when the Ashthottaranama (108 names of the Lord as given in the Varaha Purana) is read. This is an ekantam (private) service, and pilgrims are not allowed to witness this ritual. Abhishekam to the Lord Sri Venkateswara is performed in the early hours, every Friday. Traditional natural perfumed camphor, saffron, and milk are used for giving a sacred bath to Lord Venkateswara. The namam (white religious mark on the Lord’s forehead) is drawn with an intermediate thin tapering line of musk. Chanting of Vedas and prabandhams: Abhishekam is then performed for the gold image of Sri Lakshmi which hangs in a gold chain on His chest, to the chanting of Sri-Suktam. And at the end, a harati of camphor is waved. The Lord is dressed in a pitambaram along with valuable ornaments. The saffron water collected from the Lord’s body is the Abhisheka Tirtham; it is considered to be holy since it has been in contact with His body. It is given in small spoonfuls to the pilgrims during the Sarvadarsanam that follows as theerthams. Abhishekam is conducted every Friday, it lasts approxiamately for one and half hours from 0400 hrs. Holders of Rs. 12,250.00, Rs. 750.00, Rs. 300.00 and Rs. 150.00 (per head) tickets are admitted. Only a limited number of tickets are issued for Abhishekam. On Friday, Tomala Seva and Archana are conducted from 0700 hrs to 0800 hrs. Sri Malayappaswami (utsava murthi), Sridevi and Bhudevi are seated in an unjal in the Aina Mahal (Hall of Mirrors) and swung to the accompaniment of Vedaparayanam and Mangala Vadyam. Vasanthotsavam is a festival of colours. It is a periodical festival celebrated in the month of vasantham. This seva is performed in the Unjal Mandapam. The Mandapam glows with the lights of sahasra deepa (a thousand earthern lamps). The Lord is seated on an unjal, which is rocked gently to the accompaniment of a clarinet orchestra. 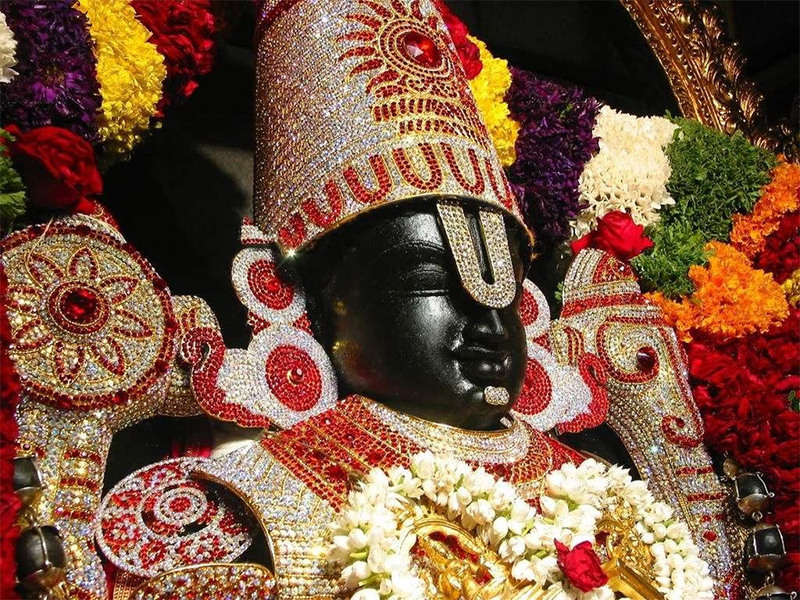 Tiruppavada, on Thursday, the rich garments and ornaments with which Lord Venkateswara is adorned on the previous Friday are, to a large extent, removed and a bare minimum (dhoti and uttariyam) is left on His body. This process is called Sadalimpu or Sallimpu (loosening or removing). The Lord is dressed in a laced velvet gown. After the evening puja and Naivedyam on Thursdays, the Lord’s deity is covered with garlands of flowers extending from the crown to His feet. This decoration – exclusively with flowers – is called Pulangi Seva. This is an arjitha seva (paid seva), admission for which is given on the payment of a fee. 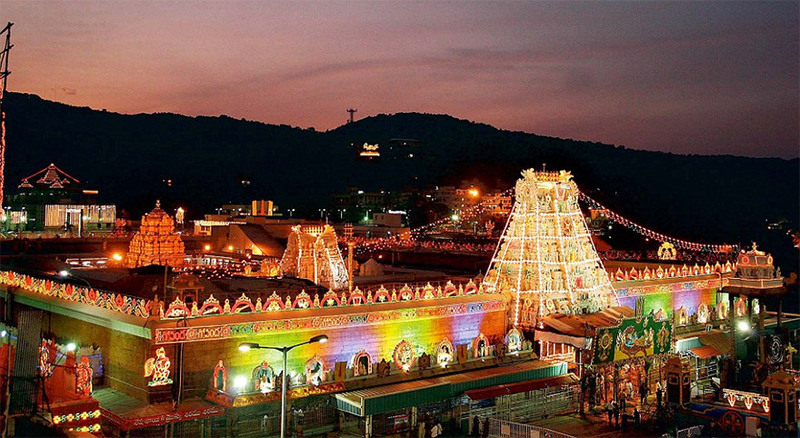 Brahmotsavam is performed for one day in an abridged manner within the temple precincts. 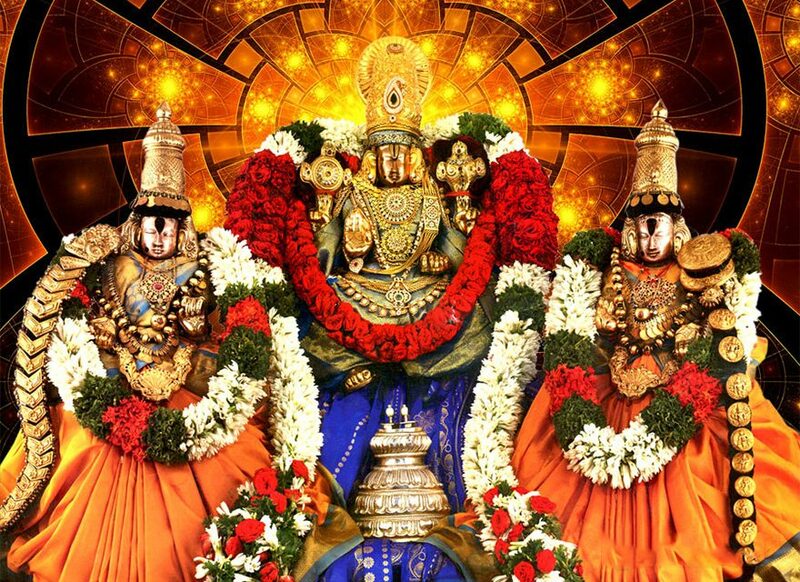 Sri Malayappaswami (utsava murti) with His two consorts is worshipped in the Kalyana Mandapam with Vedic mantras and rituals and mounted on three vahanams – (golden Pedda Sesha Vahanam, silver Garuda Vahanam and silver Hanumantha Vahanam). This seva is performed after Kalyanotsavam. The programmee is exelent, the rates of tikets place where the tickets are available at outside thirumala-Tirupathy may be furnished in the newslettter then and there please. i loved hearing of the wide range of pujas ! before i pass i would enjoy giving Sri Sri Balaji Venkateshwara my own prasadam stuff, what better way to spend ones last moments than at The Lotus Feet of The Lord ! ! ! ! This is an excellent information which everyone should know as balaji is to one and all in the world.Very many thanks for taking this step of explaining things which are performed to the favorable deity. Great website covering range of articles….